The top checkbox enables/disables the screen saver. With the slider below it, you control after how long an idle time the screen saver kicks in. One slider determines after how many minutes the screen is powered off. The other, after how many minutes you need a password to unlock your machine. 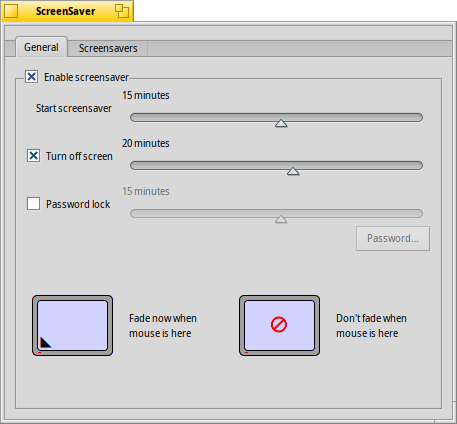 By clicking into different corners of the two screens at the bottom, you tell the system when to immediately start the screen saver or when to prevent it from kicking in when you rest the mouse in the indicated corner. Click in the middle of the screens to disable that feature again. 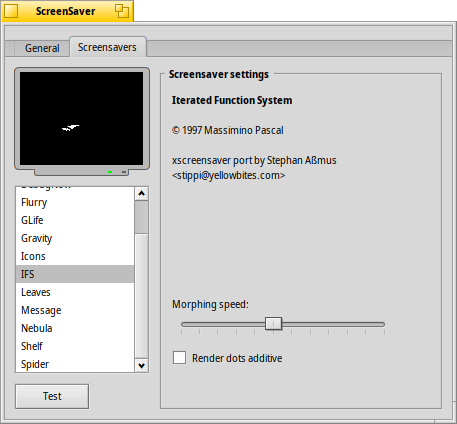 The second tab shows a list of all installed screen savers and their individual settings. You can test your settings with the Test button below the list. /boot/system/non-packaged/add-ons/Screen Savers/ for screen savers available to every user. /boot/home/config/non-packaged/add-ons/Screen Savers/ for screen savers only available to yourself.